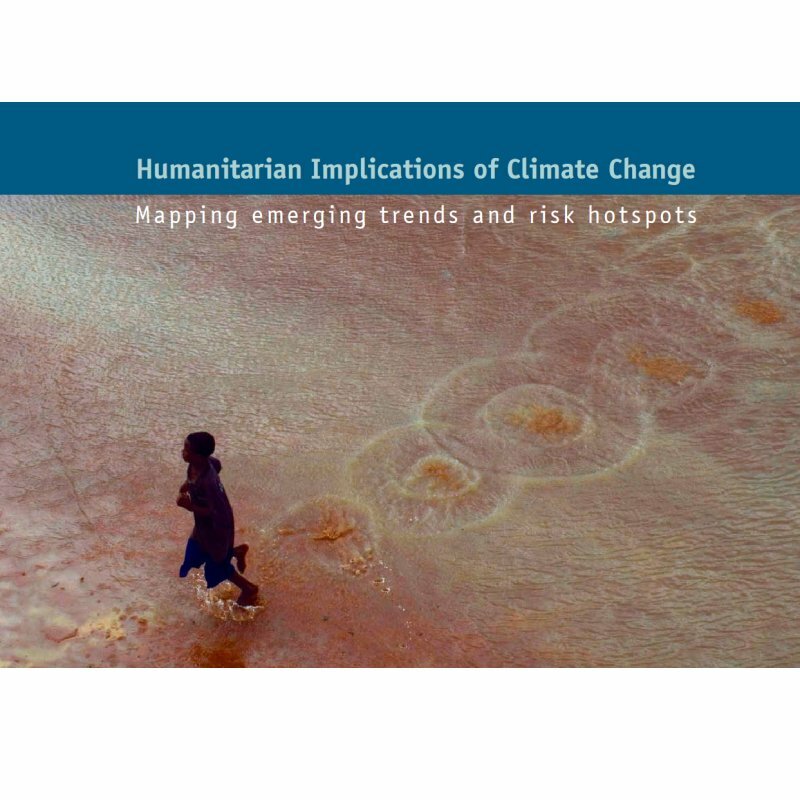 The UN Office for the Coordination of Humanitarian Affairs (OCHA) and the Care NGO published last week an interesting report on the humanitarian implications of a full scale climate change. According to the conclusions, India, Pakistan, Afghanistan and Indonesia (representing populations worth of 1,587 million people) are particularly at risk from increasing climate-related phenomena. But hope remains as the authors note, it is still time for us to prevent the worse from occurring if we tackle climate change right now. India, Pakistan, Afghanistan and Indonesia are among the pivotal states identified as climate change “hotspots” – countries particularly vulnerable to the increase in extreme drought, flooding, and cyclones expected in the coming decades – according to a new report commissioned by humanitarian relief agency CARE International and the UN Office for the Coordination of Humanitarian Affairs (OCHA). “Leaders and communities in these pivotal states and in other states at risk in the Sahel, Horn of Africa and southeast Asia are already facing enormous political, social, demographic, economic and security challenges. Climate change will greatly complicate and could undermine efforts to manage these challenges,” said Dr. Charles Ehrhart, climate change coordinator for CARE International and one of the report’s authors. “Over the last few months, we have witnessed harrowing images of people struck by natural hazards in the most disparate parts of the world, including Hurricane Ivan in Madagascar, severe drought in parts of South and East Asia, and most recently Cyclone Nargis in Myanmar,” said John Holmes, United Nations under-secretary-general for humanitarian affairs and emergency relief coordinator. The study looks at the most likely humanitarian consequences of climate change over the next 20 to 30 years. The authors map specific hazards associated with climate change, focusing on floods, cyclones and droughts. “The likelihood of floods, violent storms and droughts resulting in disasters is determined by a number of factors, including timely access to proper equipment, information, and the capacity to exert political influence,” explained Dr. Ehrhart. “The striking lack of these explains why poor people – especially those in marginalized social groups like pastoralists in Africa, women and children – constitute the vast majority of disaster victims,” he added. The study says that we will witness, and may already be experiencing, an increase in the intensity, frequency, duration and extent of many weather-related hazards. “However, these hazards will not necessarily cause a corresponding rise in disasters if world leaders act now,” said Dr. Ehrhart. Providing essential services and long-term social protection systems for the most vulnerable populations. 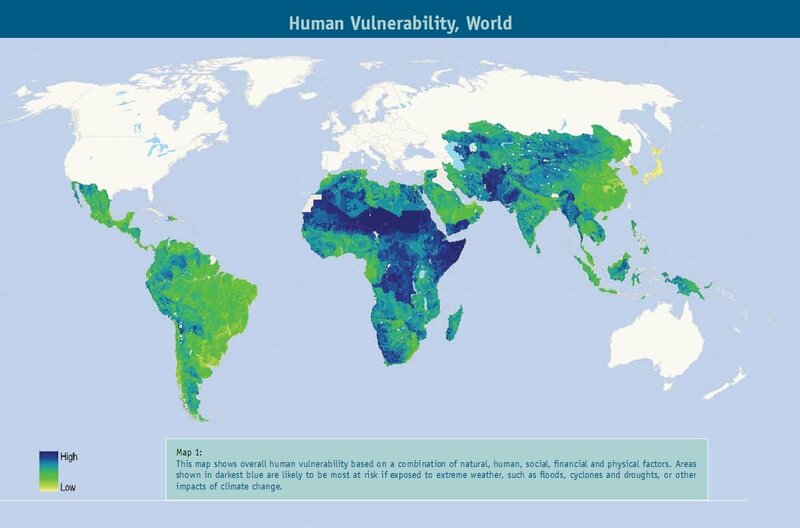 According to the authors, the purpose of mapping these “hotspots” is to help policymakers grasp the extent of challenge the world faces, and encourage humanitarian actors to adapt their response strategies to the realities of the increased and, in some cases, novel risks emanating from climate change. The launch of this study coincides with the start of the United Nations Framework Convention on Climate Change meeting that is being held in Accra, Ghana from 21-27 August. Participants attending the International Disaster and Risk Conference in Davos, Switzerland, during the last week of this month will also appreciate the findings of the joint CARE International and UNOCHA report. Note : the population figure above comes from the CIA World Factbook.